In healthy animals, microscopic structures within the kidneys called nephrons take on the task of removing wastes and toxins while helping maintain proper levels of nutrients within the blood. In cats with chronic kidney disease (CKD) or renal failure, these nephrons perform at reduced levels or stop functioning completely, leading to serious health issues if left untreated. While CKD can and does affect virtually any type of animal, the disease occurs in felines at rates 2-3 times higher than dogs, especially in geriatric populations. While your veterinarian may prescribe medication to mitigate symptoms, adopting a therapeutic renal diet can reduce the workload on the kidneys by reducing certain substances. Because the kidneys serve as the primary route of phosphorus excretion, many veterinarians will recommend a diet that is low in phosphorus. Note: Healthy Paws does not cover prescription diet costs. Phosphorus and calcium are critical for maintaining strong bones and teeth throughout all life stages, even before any signs of kidney disease rear their ugly heads. Because the two elements typically exist in homeostasis (a reduction or increase in one usually results in a similar reduction or increase in the other), maintaining normal levels of both elements in the blood is important. Vitamin D, parathyroid hormone (PTH), and the kidneys all play a role in regulating phosphorus levels in cats. Reduced kidney function and kidney failure can lead to an overabundance of this substance (Hyperphosphatemia) and similarly high levels of calcium (hypercalcemia), potentially resulting in the calcification of soft tissues throughout the body. As obligate carnivores, cats cannot produce some amino acids and vitamins in their own bodies as most omnivores and herbivores do. This means that compared to dogs and many other animals, cats require a significantly higher level of dietary proteins to supply Vitamin A, niacin, tryptophan, taurine, arginine, and other elements required for good health. High-protein diets are often seen as being too-high in phosphorus, but this is not always the case as the phosphorus:protein ratio varies widely across different high quality protein sources. Some grains have a high phosphorus ratio, but so do whole eggs and some animal proteins. This is not a problem for normal, healthy cats on a typical diet, but low-phosphorus diets must meet the caloric and nutrient needs of the cat while reducing it as much as possible. Consider lower-phosphorus protein sources like egg whites and animal meats to help maintain needed dietary proteins while limiting problematic ingredients. Egg whites and some animal meats tend to have a lower phosphorus to protein ratio, which will help your cat get the high quality protein she needs and can be an excellent source of lean dietary protein content for felines with compromised kidney function or kidney disease. Consider introducing your cat to low-phosphorus, fresh dietary foods like watermelon, apples, bananas, green beans, carrots, broccoli, zucchini, and blueberries. Avoid high dietary portions of cereal grains or animal products known to include a higher ratio of phosphorus, such as rawhides, jerky treats, and real bones. Be sure to understand how to read and interpret nutrition labels on commercially-produced cat foods. American Association for Feed Control Officials (AAFCO) guidelines for phosphorus in foods for healthy cats is as follows: 1.25 grams per 1000 calories for maintenance and 2 grams for growth. Remember that these levels are for normal diets. CKD-optimized diets should have significantly lower levels. Ask your vet about which level is right for your cat. 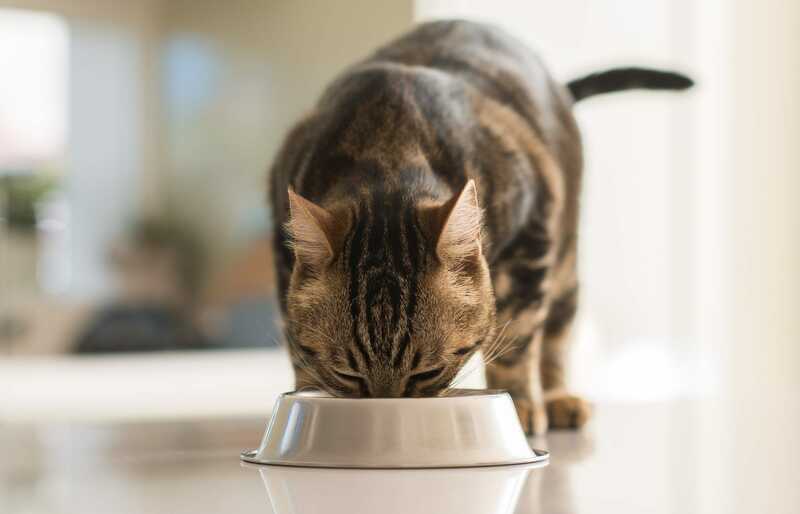 When transitioning to a low-phosphorus therapeutic diet, it is important to be patient as you introduce the new diet over time, gradually increasing the percentage of the new food offered beside your cat’s previous cat food. Many cats struggle to accept therapeutic diets, but successfully managing the transition is important to improving feline health. Warming the cat food to her body temperature (approximately 101℉) may help increase palatability. Reduced kidney function or kidney disease often puts felines at increased risk of dehydration. Along with a constant supply of fresh water and a cool environment, moisture in your cat’s food can help keep your cat hydrated. Fresh and wet foods typically offer significantly more available moisture than dry foods. Changing your cat’s food (from wet or dry food) can be a struggle even under the best circumstances, and meeting the requirements of a low-phosphorus diet only add to the complications. Still, it is well worth the effort to get your cat the nutrition and energy she needs while avoiding nutrients that unnecessarily tax the kidneys. Talk to your veterinarian about any specific dietary needs your cat may have, and any advice that can help you offer her the right kinds of foods that will keep her as happy and healthy as possible for years to come. Healthy Paws does not cover prescription diets, however, other treatments to help Chronic Kidney Disease and related symptoms are part of your plan. Find out more by getting a free quote.